India's New "Robin Hood" Budget Taxes The Rich And Gives Breaks To The Poor : Goats and Soda To win support among the poor, Prime Minister Narendra Modi has issued a massive new budget that lends a hand to low-income folks and takes cash away from the wealthy. 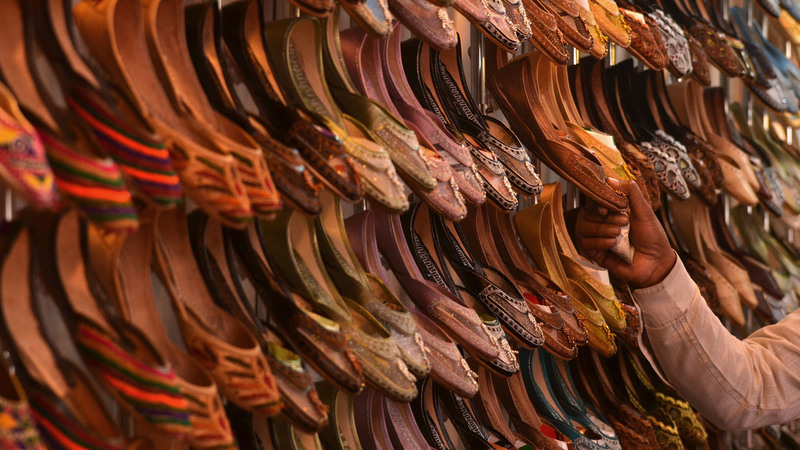 Traditional Punjabi shoes are displayed at a trade expo in Amritsar, India. The country's new budget will cut the taxes on materials used in heels and soles. The local media are calling it the "Robin Hood" budget. The government of Indian Prime Minister Narendra Modi, eager to win support among the urban and rural poor, is announcing programs to improve conditions for low-income people and provide tax breaks for necessities and items that might improve their lives. Meanwhile, to bring in more funds for government spending, there are now higher taxes for luxury items. Farmers in particular are getting a helping hand — and that's a smart political calculus, because Modi needs their support to win re-election in 2019. The government hopes that multibillion-dollar subsidies for irrigation, new roads and other assists will double the income of farmers in five years. "Highly commendable," said agronomist M.S. Swaminathan, the father of India's Green Revolution. A skeptical Hindustan Times, however, notes that such income generation will "require a dramatic improvement in yields, technologies, good prices for farm produce — and some magic." The budget also promises to bring electricity to all 18,500-plus Indian villages in the next 1,000 days and to provide cooking gas connections for families below the poverty line, so they won't have to burn substances like cow manure in their homes, which can cause ill health effects. Under this Robin Hood budget, those who earn more than 11 million rupees ($161,389) will now be taxed at a rate of 35.5 percent, up from 34.6 percent. As for the list of taxes (and tax cuts), sometimes it makes perfect sense and sometimes it's a little mystifying. Why pick on cashews? Here's a rundown of some new regulations from the massive new budget. Note: In many cases, the government did not give a reason for the change in a specific tax. The cost of eating out creeps up. Indian diners pay a "service tax" of about 12 percent on 40 percent of the total bill. That amount is inching up by 0.5 percent. Shoes are cheaper. The tax on rubber and resins used in soles and heels has been reduced. Golfers won't be happy. Maybe you should buy some of those cheaper shoes, because the tax on an imported golf cart will jump from 10 percent to 60 percent. Nuts to nuts. Cashews are already expensive, and new taxes will make them even costlier. Water will bring in more revenue. The tax on mineral water will go up. Indians guzzle bottled water like crazy because tap water isn't safe to drink. Products that contribute to disease will cost more. The excise tax on tobacco products is going up to discourage consumption. Cheaper health costs. To increase the affordability of treatment for renal diseases, clinics and hospitals won't have to pay duty fees on imported parts for kidney dialysis equipment. Gamblers will be losers. Lottery tickets will cost more, and the tax on horse race winnings will rise from 5,000 rupees (about $73) to 10,000 rupees ($146). Fancy cars will cost more. With pollution a huge concern, there's now a 4 percent tax on big cars that use a lot of gas, like SUVs. In addition, India's rich will pay a premium for luxury cars, with a tax of 1 percent of the value of cars that cost more than 1 million rupees ($14,671). Foiled again. Aluminum foil, commonly used in middle-class kitchens, has become more expensive along with plastic bags, which are considered highly polluting. Jewel markups. The price of jewelry goes up — "excluding silver jewelry other than studded with diamonds or other precious stones, namely ruby, emerald, and sapphire." Imitation jewelry will also be taxed at a higher rate. Energy-friendly appliances will cost less. Solar lamps are now tax-exempt. Buying a new home is easier. There are incentives for first-time homeowners. Nest eggs could shrink. There are new penalties for retirement fund withdrawals above a certain amount. Some technology will be cheaper. Routers and set-top boxes for TVs that change an analog signal to digital will be taxed at a lower rate. Broadband modems and digital video recorders will also cost less owing to tax cuts. And some won't. E-reading devices will get pricier. Folk festival. Hiring a folk artist performer will cost less — the hirer will pay a smaller tax. Presumably, this measure will encourage the traditional arts. Airplane tickets will cost more. Air travel will go up as part of a hike in the excise tax on jet fuel from 8 percent to 14 percent. Jet fuel accounts for some 40 percent of the operating costs of Indian carriers; airline stocks slumped at this news. Airline consultants complain that the hike goes against the government's stated objective of making flying more affordable for the masses. Cable cars will cost more, too. The cost of a ride — mainly for tourists — will go up because of a new 14 percent tax. A few more seemingly random tax increases. Taxes on packers and movers will go up. So will taxes on "ready-made garments."